Sajali (third left) presenting a souvenir to Henry after a briefing session during a working visit to the Koperkasa Sarawak office. 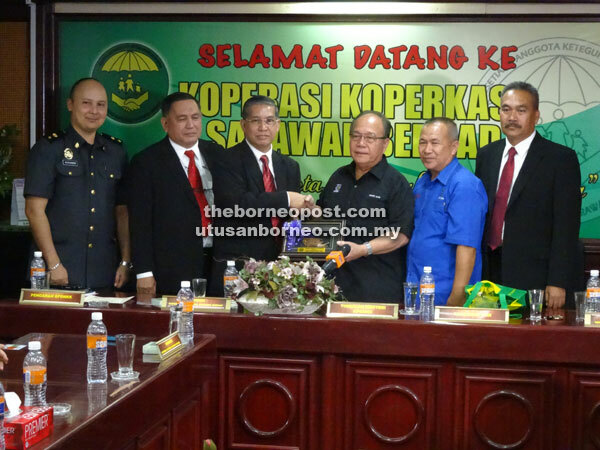 KUCHING: Koperasi Koperkasa Sarawak Berhad has been urged to expand and acquire more assets to maximise its potential. Deputy minister of Domestic Trade, Cooperatives and Consumerism (KPDNKK) Dato’ Henry Sum Agong, in commending Koperkasa Sarawak’s achievements, encouraged the organisation to continue keeping their high standards. “I am proud of the performance and achievements of Koperkasa Sarawak, but we will not be easily satisfied. Put more efforts and thoughts so we can grow stronger and bigger,” he said during a working visit to the Koperkasa Sarawak’s office at Jalan Simpang Tiga here yesterday. Henry hoped Koperkasa could acquire an asset in Lawas so as to widen their reach with bases in every district in Sarawak. “I fully support Koperkasa to acquire more assets because the value of properties will appreciate from time to time. We can do better so that our members can enjoy the profits from investments,” he said. He called on all members to give their fullest support as the cooperative strived to be the best in Sarawak and in turn assist members to improve their socio-economic standing. Meanwhile, Koperkasa Sarawak chairman Sajali Ojek said the organisation was committed to improve and enhance its performance as they target to become an exemplary cooperative in Malaysia. He informed that Koperkasa Sarawak was ranked 17 among the country’s top 100 cooperatives. He also revealed that the financial year 2016 showed an increase in revenue of RM11.3 million compared with RM10.5 million in 2015. “So we are expecting to give a total pay-out dividend of 18 per cent this year which is one per cent higher than 2015,” he added. Koperkasa Sarawak has about 24,000 members in six branches throughout Sarawak. Also present were Malaysia Cooperatives Commission Sarawak Branch director Osman Ismail, KPDNKK Miri Branch chief Alexander Averon Suwin, Koperkasa Sarawak treasurer Abang Shith Abang Joss, KPDNKK officers as well as staff of Koperkasa Sarawak.